The month of May is a fairly light month for Microsoft's Patch Tuesday. Microsoft release of two security bulletins to mitigate two vulnerabilities dealing with holes in its e-mail programs and Visual Basic for Applications (VBA) programming language implementation built into office. Successful exploitation of these vulnerabilities allow an attacker to gain complete control of a user's machine. Affected systems and software include Windows 2000, XP, Vista, Windows 7, Server 2003, Server 2008, Office XP, Office 2003, 2007, Microsoft Oiffice System, Microsoft Visual Basic for Applications, and Visual Basic for Applications software development kit. However, users with Windows 7 and Server 2008 R2 are not vulnerable with default system configurations. Adobe also released a critical security update for Shockwave Player and less critical for ColdFusion. Microsoft believes that code for this exploitation of this vulnerability is not likely to be seen in the wild within the next 30 days. 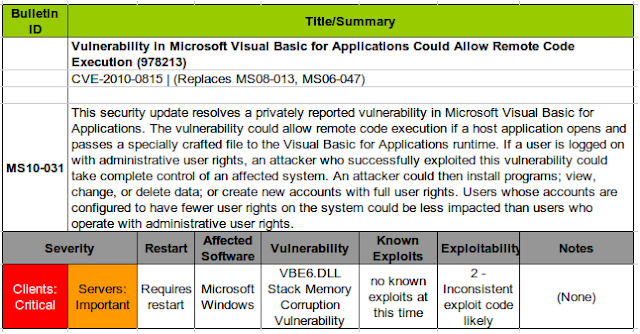 However, because of the possibility, Microsoft has classified the MS10-031 as critical. 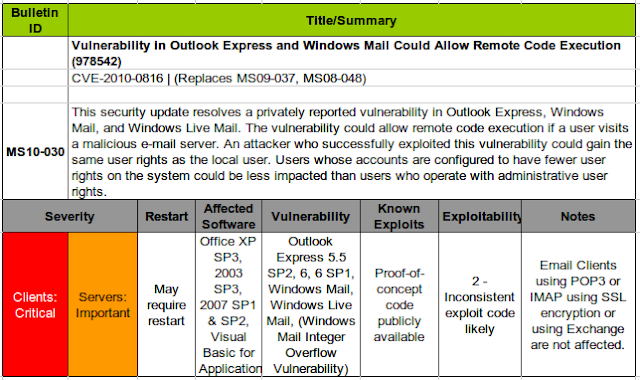 A remote code-execution vulnerability was reported which affects Windows Mail client software including Outlook Express 5.5 SP2, 6, 6 SP1, Windows Mail, and Windows Live Mail. However, default installations of Windows 7 and Server 2008 R2 do not include Windows Live Mail and are therefore not affected by this vulnerability. Proof-of-concept code is publicly available; so be quick to test and deploy the patch as soon as possible. Man-in-the-middle Attack: Attacker intercepts and manipulates a user's POP3 or IMAP connection to intercept communications between the client and a legitimate email server. An attacker can exploit the Windows Mail Integer Overflow Vulnerability by tricking a user into connecting to a malicious mail server. A successful exploit involves a currently logged-in user and the execution of arbitrary attacker-supplied code. An attacker cannot exploit a machine by simply sending a malicious email. A user uses an affected email program, but uses an Exchange Server and does not use POP3 or IMAP. However, it is still recommended to install the update. An attacker attempting to intercept and modify legitimate POP3 and IMAP communications across an untrusted network such as a Wi-Fi hotspot is the most likely attack vector. However, an attack is less likely to succeed if users check the option in their mail account to encrypt the POP3 or IMAP protocols with SSL. A less likely scenario involves an attacker tricking a user to connect to a malicious email server. This would involve making the user change their email client configuration to connect to a malicious email server which would require either a great amount of social engineering or the attacker would have access to the user's local area network (LAN) and poison the DNS entry for the email server to change the legitimate email server address to that of the malicious server. Microsoft is still developing a fix a proof-of-concept exploit for vulnerabilities in SharePoint Services 3.0 and SharePoint Server 2007 which could lead to attacks in cross-site scripting in Internet browsers such as Internet Explorer (IE).